I used to hate running. I remember the days of high school field hockey practice in the hot, humid August heat, when my lungs would burn, my knees would swell, and I’d throw up more often than not. Fast forward to today and running has completely transformed my life and business. Three days a week, I jog around the lake with my pup and enjoy the crisp morning air. I feel grateful for the birds chirping and gentle glow as the world wakes up. I feel energized and ready to take on the day. It’s hard to talk about it without sounding cheesy, but all the clichés are true. I’ve completed four marathons and with each step, I’ve learned so much about myself. Running has helped me find peace on anxious and stressful work days. It’s helped me push past what I thought I was capable of. It’s helped keep me happy and healthy when things could have easily gone the other way. But I’m not telling you this to brag, and quite frankly, I don’t care if you take up running. Instead, I want to share the single most important thing you can do every day to thrive in your life and business and how you can get started today. And I promise you won't have to run. When I say I’m a runner, nine out of ten people respond that they don’t like running. “I don’t know how you do it. It’s soooo boring. I would run if it wasn’t for my [insert body part here],” they say. And that’s totally fine. Like I said, I’m not trying to push running on anyone. But this happens often enough that I like to steer the conversation toward what kind of workout you DO enjoy. Because finding some sort of physical exercise that you can make a part of your daily practice can have amazing RESULTS, not just physically, but mentally too. Those endorphins can be a real game-changer, helping you to find more joy and fulfillment in your everyday. And you guys—joy and fulfillment are magnetic, attracting more leads, more clients, more income, and more impact. You see, I have this theory that there’s some movement, some sort of exercise, for everyone out there. And I think that most people just haven’t given themselves a chance to find it yet. Think of it kind of like your taste buds. If you hate broccoli you don’t give up on every other vegetable out there. You keep trying things until you find something that you DO like and then you eat more of that vegetable instead. The same thing goes for workouts—don’t give up on all kinds of movement just because you haven’t found something you enjoy yet. Keep looking because when you find an exercise you DO enjoy, you’re going to seeing results. You’ll find gratitude where there used to be stress, focus where there used to be overwhelm, and confidence where there used to be self-doubt. Those are the very feelings that cultivate more action and more income in your business. For example, I always have the best ideas when I’m out for a run. Why? Because It gives me the SPACE I need to let my mind wander without the pressure of “getting it done” right this second. It gives me the mental clarity I need to refine my sales call, the motivation to finally start that podcast, and the courage to write that blog post that feels like a stretch outside my comfort zone. And it comes way easier than it would sitting at my desk staring at a blinking cursor. I picked up running after college when I moved to NYC and decided that I needed to do SOMETHING other than sit at a desk all day. I lived a few blocks from Central Park and was always envious of the people that pranced around the park each morning, seemingly effortlessly. How could something that had brought me so much pain in the past come so easily to others? So I did something that I hadn’t done before—I picked up a book on the topic. And suddenly it all made sense. The book explained that the reason most people don’t like running is that they start off too quickly. A friend signs you up for a 5k, you don’t train for it (probably because you’re not really sure how), and you struggle the entire race, swearing you’ll never do THAT again. It suggested a different way of training and I learned the magic of intervals. When I started running, I would run for two minutes and walk for one. Rinse and repeat. Gradually I got stronger. And gradually I was able to run for longer. I ran my first ever 5-mile race in intervals. And later, my first ever half marathon in intervals. When you’re looking for an exercise that works for you, remember to start off slowly. Ease into it, start with what you’re comfortable with, give your body time to adjust, and build up from there. The same way you don’t go from having a newsletter list of 0 to 60,000 engaged subscribers overnight, you also don’t go from couch potato to marathoner overnight. Experiment and give yourself a bit of grace along the way. And know that these skills translate to business too. Giving yourself permission to experiment and go at your own pace will always serve you well because you’ll be building a business that is specific to YOU and your own definition of success. Furthermore, taking actions that are in alignment with that keeps you from being constantly in conflict with your own desires (aka the single best way to burn out and hate your business). Because let’s face it, when it doesn’t feel good, we never get the results we want—in life or in business. We all know that being an entrepreneur can bring up your own STUFF on a whole new level. The pressure you put on yourself, the emotional baggage, the self-doubt—it can be crippling and paralyzing if you let it. Which is why I like to suggest making movement a part of your morning routine. You see, most people think of the physical benefits when they think of exercise, but I’ve actually found the mental benefits to have far more impact on my overall wellbeing. Working out in the morning sets the tone for my day. It helps me to start each day off with a positive and productive attitude knowing that I’ve already accomplished something, bringing that momentum into what’s next. The endorphins don’t hurt either. That’s why when I’m in a busy season and I’m pulling longer days, I’m even MORE committed to getting that workout in. I know how easy it is to dismiss your own wellness when there’s so much else on your plate, but establishing a daily practice that makes your own wellness a priority is a wonderful reminder of what’s most important: YOU. Because spoiler alert: you ARE the business. I also realize that I didn’t always feel this way about my workouts. 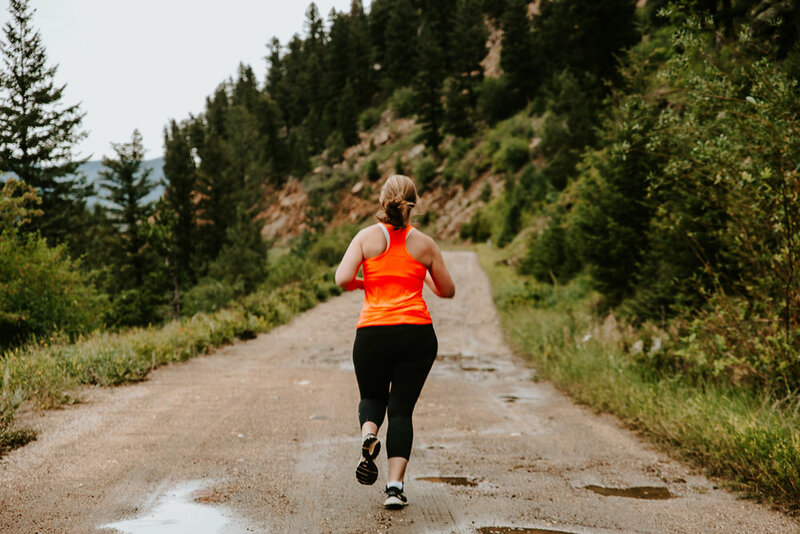 There was a time when I felt those morning runs were taking up valuable space in my calendar that I could be using for other business-related tasks, like content creation or finding the bottom of my inbox. To be honest, sometimes I still feel that thought creeping in. When that happens, I make a conscious choice to think about it differently. I repeat the mantra, “Taking care of myself is the most important work I do every day.” There’s a part of me that deeply knows I can only show up as my best self when I make my own wellness a priority. I mean really think about it. When you’re showing up as your best self you’re wayyy more likely to keep that email response friendly and professional when a client asks you to revise the color purple in their logo for the 48th time this week (I’ve been there—I feel your pain). And consequently, you’re more likely to get a friendly and professional response. I can only think that the world would be a happier place if we all made our own self-care a priority because of how differently we show up for others when we do. Sure there are days when running comes easily. I’m jamming out to T. Swift. The weather is perfect. My muscles are rested. But there are also days when it’s hard. The dog is pulling me every which way. It starts to rain. I’m sore from the day before. But running has shown me again and again that I can stick with it, even on the days that it’s hard. You guys, this is such a valuable business lesson. Anyone who has been in business for a hot minute knows that it isn’t always smooth sailing. Launches don’t go as planned. Ads don’t resonate with your audience. Clients don’t respect your boundaries. There will always be stuff that comes up. But sticking with a form of movement, whatever it is that you choose to do—from pickleball to mountain biking, to yoga—will build your confidence and your endurance. It may push you, it may ask more of you than you think you’re capable of, but it will always show you that you’re stronger than you may think. And THAT thought is pure GOLD in both life and business because it will help you to keep going even when it’s hard. Because that self-doubt? It never fully goes away. As I prep to launch a podcast—scheduling interviews, finding an editor, preparing questions, and designing cover art—I’m struck by how much SELF-coaching is involved. Acknowledging the voice in my head that says it’s hard and reminding myself that I can do hard things. And then do it anyway. Don’t write off exercise completely just because you haven’t found something you enjoy yet because movement as part of your daily practice is the single most important thing you can do every day to thrive. Finding some sort of exercise that you actually LIKE can be a game-changer in both life and business, having huge physical and mental benefits. You’ll start your day feeling positive and productive, show up as your best self, and keep going even when it’s hard. And those skills are invaluable in both life and business, resulting in more aligned action, more income, and more success that actually FEELS like success. Have you found a form of exercise or movement that you absolutely love? How has it transformed your life and business?